The 2018 Emmy Awards saw Netflix finally score as many statuettes as HBO. Amazon might not be big in Australia (yet), but they scooped up 8 awards for The Marvelous Mrs Maisel. Add in 4 awards for Hulu and the video on demand platforms accounted for 30% of the trophies on offer. Here in Australia, the recently published Moving Image Moving Landscape Report found that 36% of producers have created content for streaming services. It’s time to explore streaming video in more detail. So is there hope for other players? Yes. For many consumers, Netflix alone simply isn’t enough. In the vast majority of markets, SVOD service stacking is the norm – that is, customers subscribe to more than one platform. No doubt it’s the main reason consumers are subscribing to multiple services. Exclusive content has been cited as a key reason Netflix has been able to increase average revenue per subscriber – in contrast to music services like Spotify which don’t have the same exclusive content. Screen Australia’s 2017 report found 22% listed it in their top 5 reasons for signing up. No surprise then that all the providers are investing so much in content. The graph below shows 2017 figures – estimated Netflix spend for 2018 is a massive US$12-13 billion. Netflix may dominate the subscription market, but it’s not the most used video on demand platform in Australia. Screen Australia say that honour goes to YouTube. We all tend to forget advertising-funded streaming video, but it’s not dead yet! It’s worth noting the high usage of BVOD – broadcaster video on demand, also called catchup TV. Channel 7, Channel 10 and ABC iView each boast 45% or more of consumers watching at least a month. PWC’s Entertainment and Media Outlook, released in June this year, has a section dedicated to subscription TV. It predicts 30% growth in subscription services, with much lower growth for content delivered via premium box. Internet speeds still pose a challenge for adoption. The rollout of the NBN and forthcoming 5G networks should help overcome this. There’s a risk of major content studios (and sports events or associations) going it alone, which could further split the market. What about local Australian content? The big question for Australian content producers is what impact all these changes will have on them? The Screen Australia report showed flexible timing and the ability to skip ads were bigger incentives to sign up than content. That’s discouraging at first sight, but it might just be because there isn’t enough Australian content available. The report also showed that 1 in 5 non-subscribers would be interested in SVOD services featuring more Australian content. Plus, many existing subscribers would pay higher prices for more exclusive Australian content. Could investing in Australian content could help the platforms build subscribers and revenue per subscriber? Or is it simply a cost? Traditional broadcasters have local content requirements which they must fulfil by law. But online players like Netflix and Stan are not – at the moment – subject to those requirements. The government enquiry into Australian content on broadcast, radio and streaming services has been extended yet again. What’s happening on the ground in the meantime? In essence, everyone’s playing it safe. Original content can be a strategic advantage, but it’s expensive. And risky. What if no one likes your new feature film or series? Reality TV, gameshows and lifestyle programs reduce the cost of a failed investment. Yet as The Bachelor, The Block and more have shown, they can deliver rating and advertising gold. Another way to play safe while still producing higher cost genres is to work with a partner. So for example, Netflix and ABC have collaborated on ‘Pine Gap’ – a 6 part series which is expected to release on both networks simultaneously. As already noted, the subscription video services are investing in local content. 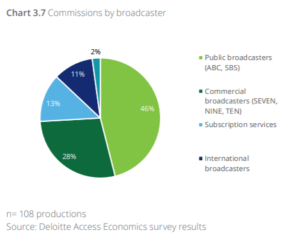 Screen Australia report they account for 13% of commissions. Yet they too are taking lower risk options. Stan’s best known original content is probably the two series Romper Stomper and Wolf Creek. Both were series based on successful feature films. Then there’s the comedy series Plonk. Network Ten made the first series and aired it on Eleven, but the second series moved to Stan. Meanwhile Netflix have lured Chris Lilley away from the ABC for a 10 part comedy project. In all cases there’s a ‘known quantity’. There’s still risk, but less risk. Speaking in the context of the Nine / Fairfax merger, Stan CEO Hugh Marks sees ‘quality, premium Australian content that audiences want to engage with‘ as a competitive advantage. Ted Sarandos, Chief Content Officer of Netflix, sounded equally positive when he spoke to Fairfax back in 2016. In 2017, Netflix announced their first Australian feature film, Tidelands. It’s currently in production in Queensland. The amount of local content from streaming players is small so far. Whether it will grow – and how fast it will grow – depends on two things. How well the early local content performs. And the results of the government enquiry. One positive sign for content creators is the SVOD service-stacking we mentioned before. If consumers will pay for more than one service, there’s less chance of a monopoly – and more reason for services to compete by investing in content. ‘We are used to producing for cable and network, with ad breaks and structured sort of play. And this is really made for binge. They’re seamless so you don’t have the same dimensions with storytelling and recaps that you do for producing for cable. There’s no way to orchestrate a series arch as it were of watching because they’re available to watch in any order. 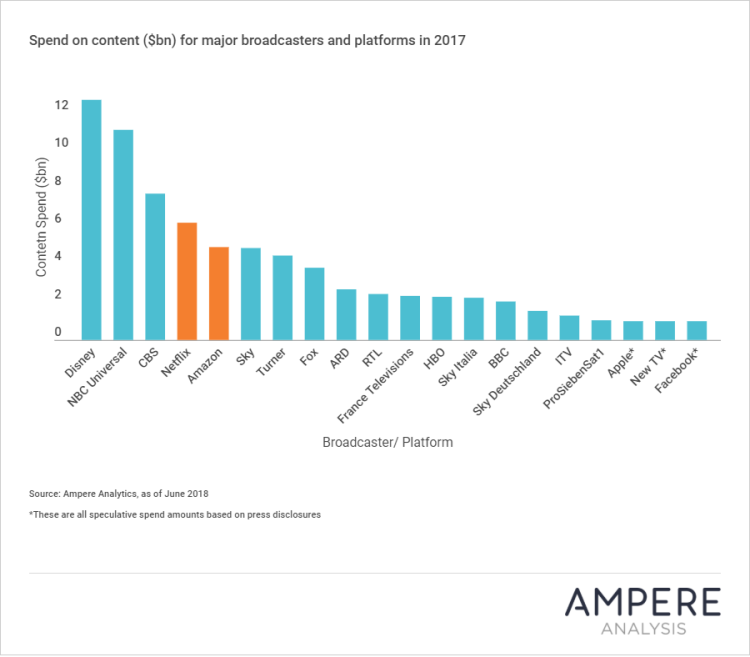 Content producers may not be able to control how much streaming services invest in local content, but they can start thinking about how to make that content work.